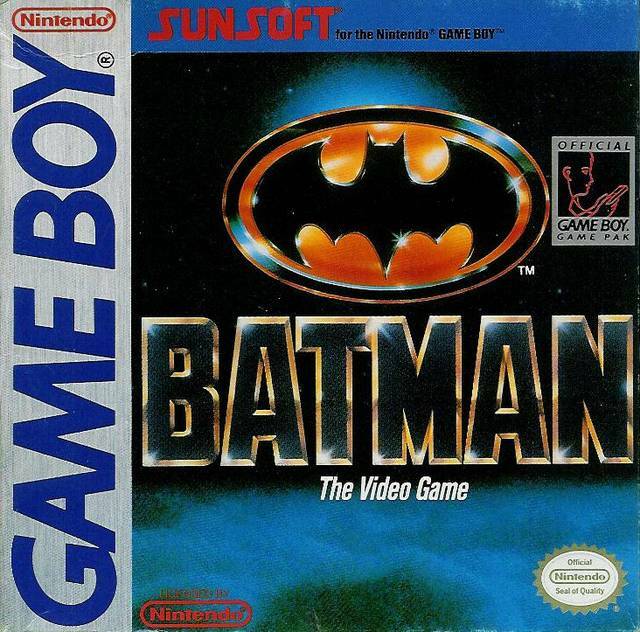 After playing through the Batman efforts produced by Sunsoft not on the NES, I had extremely low expectations going into their first Batman game on the Game Boy, one of the earliest games on the system no less. Maybe it’s because I played Batman: Revenge of the Joker prior to playing this or perhaps it’s due to my less than stellar experience with Batman: Return of the Joker on the Game Boy, but after playing through this short action game, I came away pleasantly surprised. The first thing I have to get of the way is the Batman sprite in this game. It very much looks like Batman, or more specifically, a kid in a Batman costume. I understand that screen real estate was limited on the original Game Boy so it was smart to keep things small, but guys, not too small. This is Batman after all, the guy who strikes heart in the fear of criminals, and Game Boy Batman ain’t scaring anybody. Batman: The Video Game has a lot in command with the Genesis game in that it tries to follow the plot of the movie it’s based on, while also being a precursor to the gameplay found in Batman: Return of the Joker on the NES. Though against character in a lot of ways, Batman does away with fisticuffs and uses a gun that starts off with regular bullets that can be upgraded with power-ups found within the levels which allow you to do things like shoot through solid walls or arch your bullets in a wave-like motion similar to Metroid. You can also uncover other upgrades that provide a temporary shield. In a lot of ways Batman on Game Boy reminds me of the first Super Mario Land and that is meant to be taken as a compliment. The four stages are broken up into four parts (1-1, 1-2, etc) and the plat-forming is very reminiscent of that game with tricky moving platforms and well placed enemies. The bullets also resemble the ricochet fire flower in that game, as do the blocks you have to shoot to uncover spare lives and power-ups. 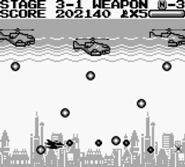 Another way in which Batman appears to be inspired by Mario Land is the inclusion of a flying stage, replacing Mario’s plane with the Batwing, in stage 3. Much like Batman on Sega Genesis, the inclusion of a playable vehicle is a welcome diversion from the main games plat-forming action. While it is a lot of fun to fly around in the Batwing though, the game gets a little too bullet hell for its own good. The regular stages are not terribly difficult and shouldn’t pose much trouble to anyone who played games like Super Mario Land, but there’s so much stuff to keep track of in the shooting segments that it’s borderline stressful. It’s also here where the game’s checkpoint system, in that it doesn’t have one and forces you to restart a level over, becomes aggravating. 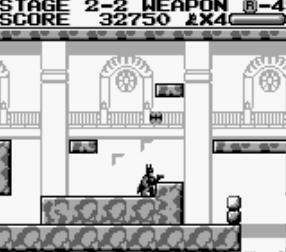 One of the highlights of other Sunsoft Batman games were the memorable boss battles, however Batman on Game Boy has only two that are fairly forgettable, but fall in line with the license: One with Jack Napier, the other with the Joker. Both play out nearly identically, the only difference being the Joker shoots more bullets and takes a few more hits. Neither offer the memorable challenge presented in both the NES game and it’s sequel, Return of the Joker, where toppling the Clown Prince of Crime was a fist pumping victory that you could brag to your friends over. As far as portable Batman games go, you can do far worse than Batman: The Video Game for the original Game Boy. It is on the short side and much easier than the NES games, but that doesn’t make it any less fun. I picked this game up for under $10 on eBay, so I encourage you if you have the means to play this game to track down a copy, just don’t laugh at Kid Batman too hard, okay?